3 Bedroom Terraced House For Sale in London for Asking Price £1,600,000. This period family home is positioned over four floors boasting double reception, kitchen and dining room, four bedrooms, three bathrooms and outdoor space in the shape of rear garden and roof terrace. There are numerous period features throughout to include, wood flooring, cornicing, fire places and sash windows complete with shutters. The ceiling height is generous and this coupled with the generous windows and favourable orientation mean the property is flooded with natural light. The kitchen and dining space on the lower ground floor leads directly onto the south facing rear garden which is an ideal layout for entertaining. The top floor acts as an indulgent master suite with direct access to the outdoor terrace space. The property is for sale with no onward chain. Allingham Street is located in the heart of Angel by the Regents Canal and within 0.25 miles of Angel Station. 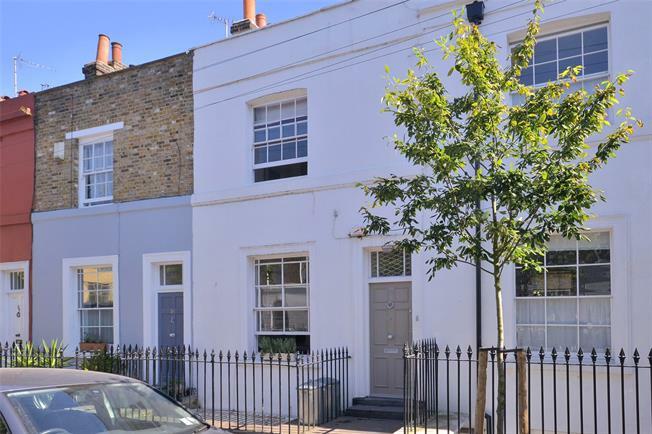 This quaint period street is a no through road and so benefits from minimal traffic despite being primely positioned for the hustle and bustle of Islington’s Upper Street which is within 0.1 miles. Local eateries and pubs include the Narrowboat with delightful water views and the Duke of Cambridge boasting tasty organic cuisine.